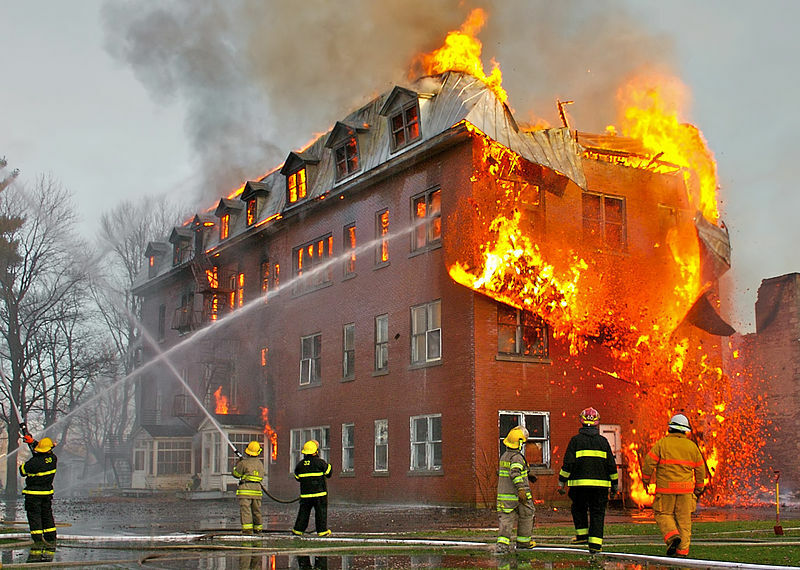 This photograph was taken during a major fire involving an abandoned convent in Massueville, Quebec, Canada. The fire was so violent that firefighters had to focus their efforts on saving the adjacent church instead of attacking the involved building. This photograph is a good example of what can be done with specialized fire photography, as the public does not have access to this extraordinary point of view and it was necessary to have fire photographer credentials to take pictures from there. Image File:FirePhotography edit1.jpg from Sylvain Pedneault; edited by jjron and licensed under the Creative Commons Attribution-Share Alike 3.0 Unported license, available on the Wikimedia Commons.